The opportunities to create our own experiences exist everywhere. We must only possess the spirit necessary to be daring in our travels, to be open to unknown possibilities and to constantly yearn for more. This essence of global exploration is captured in The Platinum Card®. Open Up the World with Platinum. 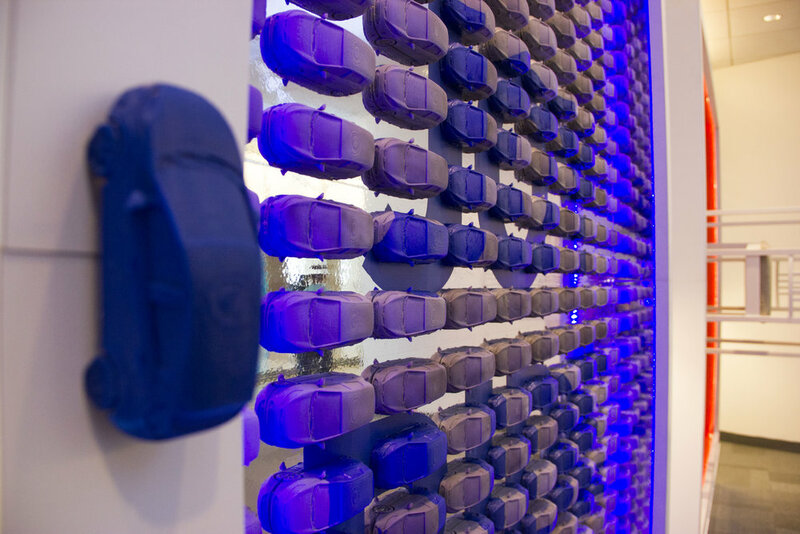 Through modern technology, the artist invites you to step into The Centurion Lounge at Miami International airport. With full three hundred and sixty degrees of perspective you become a part of the space, glimpsing at experiences that may await you, enticing you to take a closer look outside the virtual world. Few things in life satisfy like a good meal, and a master chef possesses an almost magical ability to combine flavors for a powerful, emotional experience. To the seasoned foodie or the raw culinary adventurer, nothing compares to the chance to dine under the care of world-renowned chefs. To that end, The Platinum Card serves The Global Dining Collection, offering access to extraordinary culinary events and experiences from world-renowned chefs, along with access to even more reservations at restaurants across the globe. 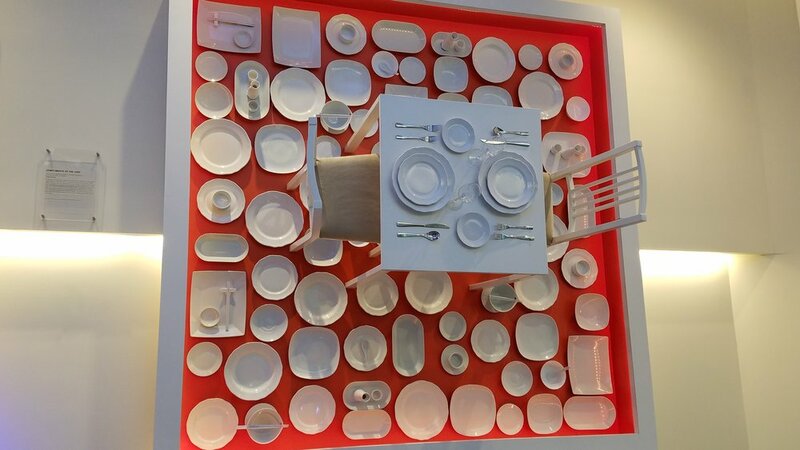 This piece focuses on a Card Member-reserved table and depicts the joy of many meals enjoyed, seen only by what remains. Routine. Travel from point A to point B at set intervals, repeatedly. Monotony. Unwavering faithfulness to predictability. What it brings is comfort in knowing what comes next. What it lacks is thrill, a jolt to the senses, and the increase in heart rate that occurs when we discover the new and unexpected. With the Uber Rides with Platinum benefit, getting up to $200 annually in Uber credits for U.S. rides—andUber VIP status, where available —is reason to find joy in your ride. Deviate from the plan and escape to destinations unseen. Take the scenic route. Set a course for discovery. And do it all within your own city or when travelling through another. The artist showcases freedom and boundless opportunity through the act of a detour, leaving us to wonder where our own joy ride may take us. Because life is unscripted, we never know when we may find ourselves in need of aid. When the need arises we hope to be prepared, or know instinctively what we must do. This work captures the feeling of uneasiness in calling for help, the uncertainty of trustworthiness, and fear of the unfamiliar. All of these become appeased through exceptional American Express service. Blood pressure reduced, panic avoided as Card Members speak directly to a comforting voice, one not acting as a distraction but as an agent of remediation, in a case of need. Because going off the map should bring about the most wondrous of discoveries. Clouds are the perfect travelers, moving unimpeded through the skies, looking in on the world with a spectacular view. Never in a hurry, always traveling light, clouds don’t overstay their welcome, they just drift along—because there’s always more to see. Soaring among them we feel free, our interests piqued by what may await us when we touch down. Yet, far too infrequently do we share their point of view. With five times (5x) Membership Rewards on flights booked directly with airlines or with American Express Travel and for eligible hotels booked on amextravel.com, how much more time will we spend up in the clouds? What will we discover when we find that we’re untethered? The sensation of flying among the clouds is displayed by the artist to represent life with The Platinum Card—one always ready to explore something new and never satisfied to remain stationary. To embrace the excitement of travel is to forgo the familiar comforts of home. Quests of adventure and discovery bring with them new experiences, yet leave behind those we have already discovered. Can we not feel familiar in a new place? Is there not an oasis to be found in our travels? 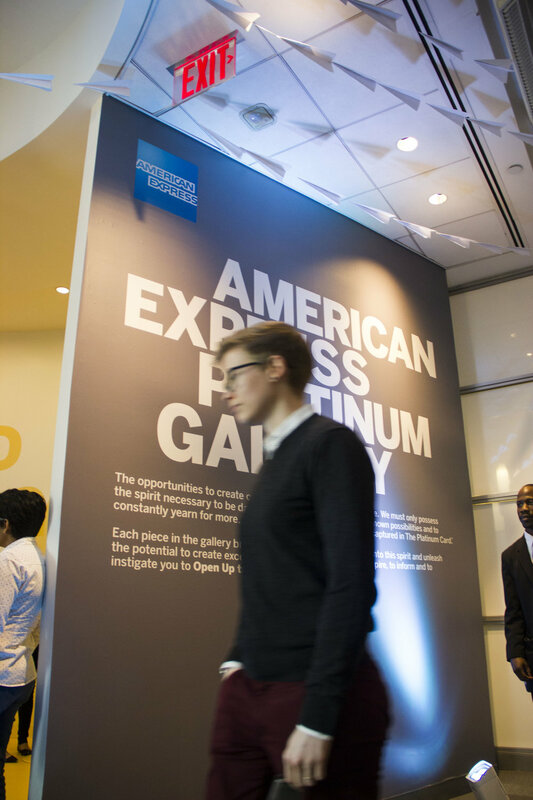 By unlocking more than 1,000 airport lounges across the world, including those you see in this piece, The Platinum Card brings Card Members complimentary access to the American Express® Global Lounge Collection—so as we travel around the world, we know we’ll still feel at home. The artist explores the tension of the familiar and the new by layering the plethora of exciting Global Lounge Collection locations. 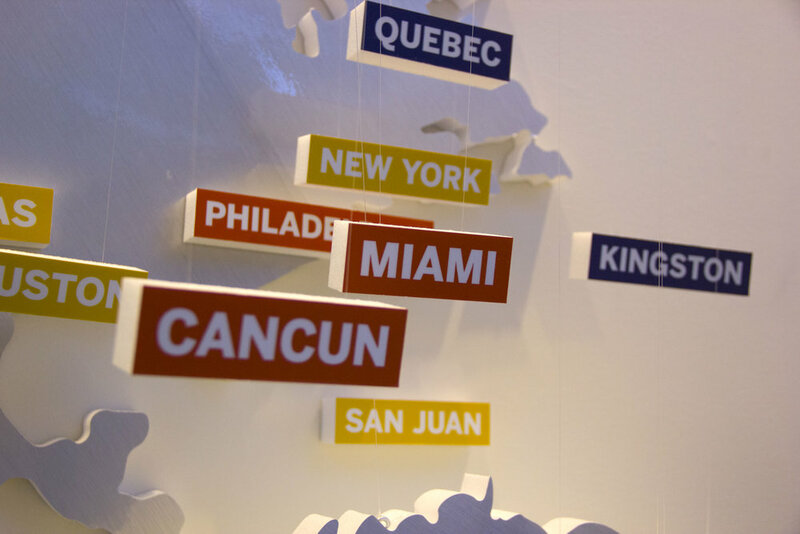 The world map hangs, like a target, for the fleet of approaching paper airplanes, turning each destination into a bullseye for travelers.